In 1987 Linda and Marvin Seppanen and family purchased a home and 20 acres of land on Garvin Heights Road in Winona Township. A short time later they began planting numerus fruit and nut trees and four variety of grapes. Some of those original Edelweiss grapes are still growing. The Seppanens soon joined the Minnesota Grape Growers Association (MGGA) to meet other grape growers and to learn more about the new industry. Their vineyards now cover four acres with more than 20 grape varieties. This spring they will plant the newest University of Minnesota developed grape, Itasca. In 2005-2006 they took classes in Vernon County Wisconsin organized by Extension Educator Tim Rehbein to teach the science of grape growing. Part of that class involved developing a grape-related business plan. 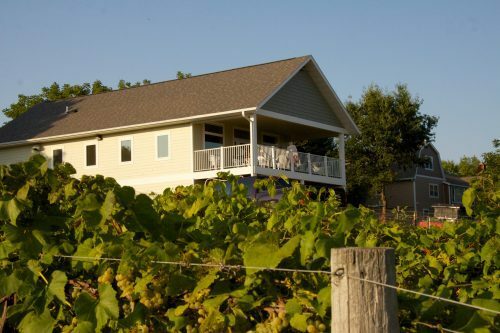 In 2006, they moved towards commercial wine production by incorporating Garvin Heights Vineyards, LLC (GHV), applying for a Federal Wine Permit, and started construction of a winery building. Small batch wines were produced for future sales. The winery building with 1,344 square feet of retail and a similar sized wine production cellar were completed in the Spring of 2007. 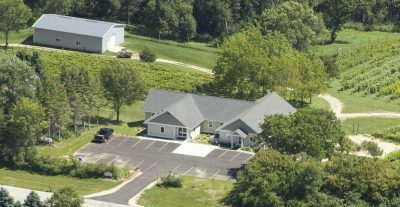 On June 13, 2007 GHV received its Minnesota Farm Winery permit to enable the selling of wines. A Blessing of the Winery was done by Rev. Mark Dumke of Faith Lutheran Church, Winona on June 17, 2007. Over the years, wine production has grown as more grape varieties became available from the University of Minnesota and other independent grape breeders. GHV now produces over 20 different wines. Many feature a single North American grape variety such as: Frontenac, Frontenac Gris, La Crescent, Marquette, Edelweiss, Brianna, and Sabrevois. Offerings also include blended, flavored, and port style dessert wines from locally grown grapes. In 2014 GHV expanded its facility by adding 2,240 square feet of event space and similar size production area on the lower level. The Ridgeview Event Center was formerly dedicated by the Winona Area Chamber of Commerce Ambassadors and the U of MN Goldy Gopher on June 2, 2015. The event center is designed to hold up to 100 guests for private parties and meeting. In 2015 GHV purchased a 150 liter Hagyó still from Hungary and started Garvin Heights Spirits (GHS). Now that both Federal and State permits have been obtained, GHS is ready to convert its grapes into Hungarian style “Pȧlinka” or fruit brandies. Look for these spirits starting soon. Starting in 2005 Linda and Marv along with grape growers from Wisconsin, Iowa, and Illinois started work on gaining federal status as an American Viticulture Area (AVA) for the drift-less area along the Mississippi River. June 22, 2009 the federal government approved the Upper Mississippi River Valley AVA. The AVA encompasses 19,144,960 acres an area 50 times larger than the Bordeaux wine region of France and 40 times larger than Napa County, CA. Today the AVA has nearly 100 wineries. In 2009 GHV and 8 other wineries located near the Great River Road in Minnesota, Wisconsin, and Iowa formed the Great River Road Wine Trail organization. The trail has grown to include 11 wineries and has as its goal the promotion of wine tourism along the upper Mississippi River Valley. The trail spans 250 miles from Cannon Falls, MN to Marquette, IA on both sides of the Mississippi River. The trail’s wineries host thousands of visitors each year and sponsor two weekend events in June and November. Marvin Seppanen has served as the group’s treasurer since its founding. GHV along with seven other Minnesota Farm Wineries and catering partner own and operate Minnesota Wine Country at the Minnesota State Fair. In 2012, the group purchased a former church diner and converted it into a venue to serve Minnesota produced wines and some of the most unique foods at the fair for the 11 days leading up to Labor Day each summer. GHV is member of Minnesota Farm Winery Association, Minnesota and Wisconsin Grape Grower Associations, Southern Minnesota Wine Grower Alliance, Wine America, and Minnesota Farm Bureau. Linda serves as president of the Minnesota Farm Winery Association. To sell wine to our many Wisconsin customers, GHV is member of Badger State Winery Cooperative. GHV is a family-owned and operated business. Linda and Marvin Seppanen along with daughter Christine Seppanen and son-in-law Jeff Johnson own Seppanen Properties, LLC which owns and manages the physical property and farming operation. Both Christine and Jeff are learning the operation and will take full ownership in the future. Linda and Marvin have visited wineries across the USA and the world and taken numerous classes to learn the grape, wine, and spirits businesses. We bring this experience to every guest visiting our tasting room and event center and enjoy talking with our customers about wine and grapes certainly but also the other good things of life.